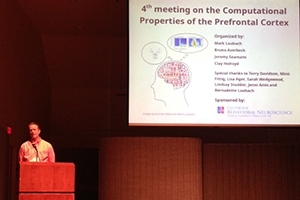 Professor Mark Laubach presenting at the Computational Properties of the Prefrontal Cortex conference. Why do we do what we do? How do we make decisions under pressure? Why do we feel regret? How much multi-tasking is too much for our brains to handle? These are some of the questions that were tackled earlier this month at the fourth annual meeting on the Computational Properties of the Prefrontal Cortex. The event was hosted by American University’s Center for Behavioral Neuroscience. The meeting focused on the prefrontal cortex (PFC), the area of the brain that controls learning, decision-making, and executive control. The PFC helps us to organize our thoughts, analyze situations, predict outcomes, make decisions, regulate our emotions, choose between right and wrong, make plans, solve problems, and learn. Understanding how the PFC works is one of the cutting-edge issues in neuroscience today. More than 70 neuroscientists attended the two-day meeting at AU’s Katzen Arts Center. Attendees were affiliated with universities from across the United States, Canada, and Europe. More than 20 American University-affiliated researchers attended the meeting, including many students from the College’s PhD program in Behavior, Cognition, and Neuroscience. “The goal of the meeting was to understand how the PFC controls behavior, how PFC neurons encode information, and how that information is transformed within larger brain networks,” said Mark Laubach, associate professor of biology and conference co-organizer. Earl Miller, Picower Professor of Neuroscience at the Massachusetts Institute of Technology and one of the leaders in the neuroscience field, discussed the role of the PFC in learning, memory, and multitasking—and how brain rhythms found in humans are also found in monkeys and rats. The second keynote speaker was Josh Brown, associate professor of neuroscience and director of the Cognitive Control Lab at the University of Indiana. Brown discussed the role of the PFC in conflict resolution and what happens in our brains when we have to make decisions when we feel conflicted. Brown is currently working on developing brain-inspired algorithms, which mimic how human brains function. The third keynote speaker was David Redish, Distinguished McKnight University Professor of Neuroscience at the University of Minnesota. Redish discussed decision-making and regret over poor decisions. He presented the results of what he called “restaurant row” experiments: when rats are placed in a circular maze with different food options along the way, they make decisions about the food presented to them, and they often experience regret about their choices. The first PFC meeting was held four years ago at the Whistler Resort in British Columbia. Laubach was a co-organizer. “The idea behind the meeting was to bring together researchers interested in the computational principles that underlie PFC function,” he said. For the 2015 meeting, the workshops focused on areas that are hotly contended by attendees. They included: Can a single computational or theory explain deficits in PFC function in animals and humans? What brain system is more important for cognition, the PFC or the hippocampus? How does the PFC deal with stimuli and the passage of time? Participants also visited labs on campus and discussed scientific issues with attendees from AU. “It was a special opportunity for AU graduate students to meet and mingle with leading scientists from around the world,” said Laubach.